Dr Barrett, in an article in the Argus, describes ''a demonstration of social organisation alike unique and impressive'' to which his attention was directed in New Zealand, the demonstration being the fact that the infantile mortality rate in the dominion has been reduced to 51 per 1000. This rate Dr Barrett contrasts with the rate in Australia (where it is 68 per 1000), with that in the United Kingdom (107 per 1000), and with the greatly higher rates in other countries. From this comparison he proceeds to show that the infant mortality rate in Dunedin is much below that in any of the other cities in New Zealand; still further below that in any of the larger centres in Australia; and only a fraction of that in the congested cities of Europe. He emphasises his argument, so far as it is directed to show that the favourable position occupied by Dunedin is due to the methods initiated in this city, by taking the average mortality for varying periods since 1900 and by demonstrating that the death rate among infants in this city has been steadily reduced. Further than this, Dr Barrett quotes official returns to show that the reduction in the infant mortality in New Zealand is practically accounted for in its entirety by the reduction in the mortality from gastro-enteritis, which is produced by improper feeding. When he seeks for an explanation of this circumstance, Dr Barrett considers and rejects the suggestion that climate, the milk supply, and the maternity home system in the dominion may severally or in combination account for the exceptionally favourable death rate among children under 12 months of age in New Zealand, and concludes that the reduction of the waste of infant life in the dominion is due to the special and practical education that is being spread among the people through the organisation and activity of the Society for the Health of Women and Children, which was established in 1907. The conclusion is one that is probably not accepted by everyone living in the midst of the operations of the society. "... the government has continued to characterise people requiring income support as work shy, drug taking, criminals who don’t care for their children, and have been happy to misrepresent the financial situation of people who have publically challenged their decisions." The overwhelming majority of people receiving welfare assistance do the right thing and follow the rules. Unfortunately, a tiny few see our welfare system as a target. And beneficiaries cycle in and out of prison at a much higher rate than non-beneficiaries. But the Greens do not believe in freedom of speech when it contravenes their religion of non-judgmentalism. Nobody can talk about real problems and possible solutions lest it offends some other group or individual. It must be easy for New Zealanders to take for granted the very many advantages your small country has. The beauty of the landscape, the clean air, the easy access to fresh water. If you have always lived here, these things might seem pretty ordinary. But they are not at all ordinary, and nor is the stability of your political system and the easy way you do business. As Conservative Perspective and Bob McCoskrie have already pointed out, Simon Collins has his theory the wrong way around. He says poverty is driving nuclear family break-up. I say it's vice versa. According to the NZ Herald, March 20, "Surprise Census figures suggest that poverty may be breaking up the nuclear family." Analyst Paul Callister is quoted saying, "...the welfare system meant many couples were better off by separating." For a nuclear family to "break-up" it has to exist first. In 2012 the proportion of unmarried births was 48 percent. In the same year, 21 percent of babies born were dependent on welfare - usually the DPB - by Christmas. Around half of these children will spend 7 or more years in the benefit system. It isn't poverty driving family disintegration. It's the availability and heavy use of welfare. This is particularly prevalent amongst Maori because welfare incomes are close to incomes from low paid, unskilled jobs. As the article notes, "Education is also a powerful factor." Exactly. In time females with qualifications and aspirations may choose not to embark on a career of poverty-stricken single parenthood. Then again, as long as it's a seemingly 'easy' option the pattern of single mothering and subsequent hardship will continue. Economic freedom does more to alleviate poverty than government aid, says Julian Adorney for the Foundation for Economic Education. A study from Daniel L. Bennett and Richard K. Vedder analyzes economic freedom and income inequality in the United States, finding that economic freedom decreases inequality, benefiting the poor and middle class more than the wealthy. Looking at the 50 states, and using limits on government to measure economic freedom (the authors looked at size of government, level of taxation and labor market regulation), the study found that most gains went to the wealthy during the initial stages of economic freedom. However, at a certain point (and 21 states had already hit this point by 2004), that result shifts, leading income inequality to decline as states grow more and more free. Campbell: We’ve got ten minutes. I haven’t asked about your welfare policy, so I’ll make it specific. We all oppose fraud. Does Labour oppose the government’s new welfare fraud policy whereby the partners of welfare fraudsters will be criminally liable for the fraud, and for the repayment of the entire amount – and not simply for the amount from which they might have indirectly benefitted. If re-elected will Labour retain this provision or scrap it ? This bill deals with one particularly troubling aspect of welfare fraud, which we refer to as relationship fraud. Relationship fraud is when someone is receiving a benefit that is dependent on them being single, such as a sole parent support—the old DPB—yet they are in a marriage-type relationship. In this case, their relationship is not simply part of their private life; they are being given money by the taxpayer based on that fact. By failing in their obligations to tell the Ministry of Social Development or even lying to hide their relationship, they continue to receive money that they are not entitled to. The reality of this offending is that it can occur only when the partner is present, but it takes two to tango. The current law means that the beneficiary, usually the woman, is held accountable for her fraud, while the partner often gets off scot-free. We say this is wrong. This bill will create a new offence to hold those partners to account. These changes strike a careful balance. They recognise that new relationships are never simple. When a partner is genuinely unaware of the fraud, they will not be liable. But if the partner knew about the fraud or turned a blind eye to it, they will be held to account for their part in the crime. I want to make it clear that these changes will not disadvantage women in a violent relationship. Ministry of Social Development investigators are extensively trained to deal sensitively with violent relationships, and the law on this point is clear that violence in a relationship will often mean it is not, for welfare purposes, a relationship in the nature of marriage. The last thing we want to do is to remove the financial lifeline that might help a battered woman extract herself from that situation. These changes will not remove this protection. The reasons why liability for the "entire amount" is incurred are explained here. You don't see me making a big fuss about welfare fraud. That's because so much 'legitimate' welfare receipt is 'illegitimate' in my mind anyway. Welfare abuse, welfare misuse.... it's all a rort. Welfare is claimed by thousands of people who would in the past have made their own way in life. Lawful entitlement does not confer moral entitlement. 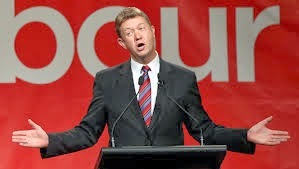 But an intention to scrap this proposed legislation shows which side Cunliffe is on. And it isn't the taxpayer's. Prompted by the NZ Herald sob-series on Closing the Gaps I thought I'd take a look at Asian incomes. They are rising rapidly. In only 5 years they have gone from having the lowest median income to second highest. The chart below shows the median income for individuals aged 15 and older. Back in 2009 the median Asian income was much further away from the average - 360 versus 512. In 2013 it's 500 versus 583. But for Maori and Pacific the opposite pattern applies - the gap between median and average is growing. The gap for NZ Europeans is steady. Equality is rising amongst Asians. Most have improving incomes. The data is given according to source. Asian self-employment is much higher than Maori or Pacific. Income from self-employment has dropped away for all groups but particularly Pacific. No remarkable 5 year change for any group. Again not much 5 year change. All groups recorded increases in income from wages and salaries but for Pacific is was almost negligible at 1%. 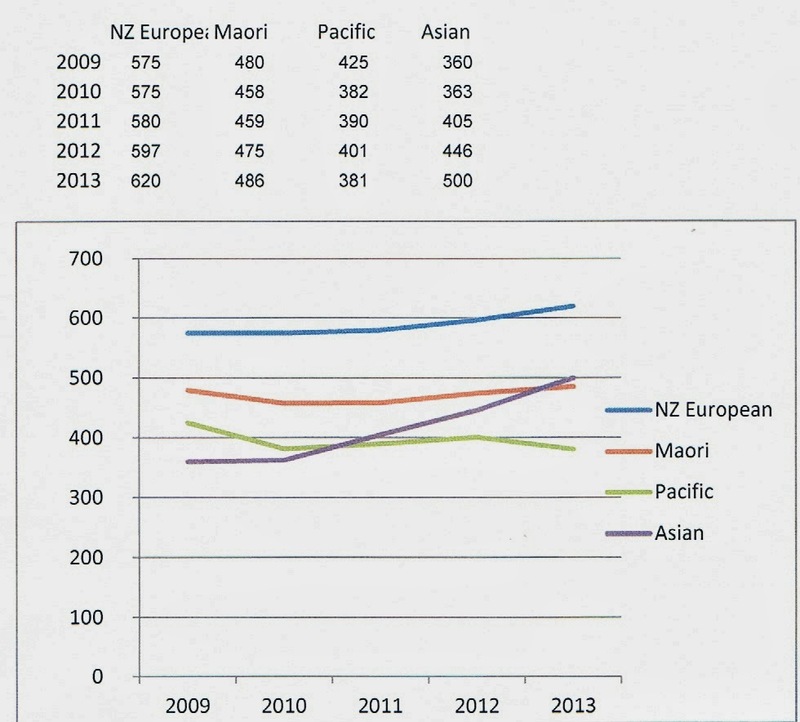 The Asian increase was greatest at 20%, followed by NZ European at 14% and Maori at 10%. Working and investing is paying off for Asians. It's the age old story of how to get out of poverty. It's not having kids you can't afford and relying on the government to bail you out. 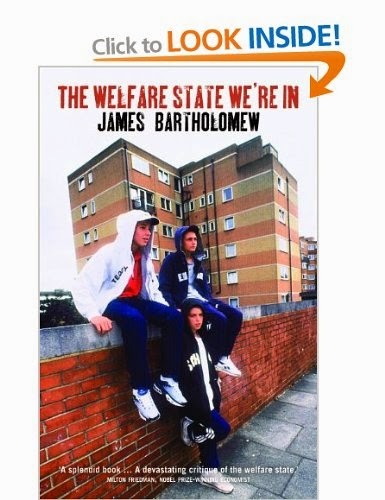 Update on Britain's "welfare state"
It is nine years since James Bartholomew published "The Welfare State We're In". It has recently been re-published and includes an introduction looking at what has changed in the interim. You can read it here. "The good news keeps coming and the bad news gets worse. Much has changed and nearly everything stays the same. The disjunction is between, on the one hand, the words, intentions and actions of both politicians and the public, and, on the other hand, the reality on the ground....overall incentives [to work] are being modestly improved... there has been progress but it is not dramatic change [but] far more lone parents are now expected to work. It is a big and necessary change...the fact remains that mass unemployment is still a permanent feature of modern Britain...the coalition government has worked hard to make significant changes in welfare benefits ... but they do not go far enough to rid us of the misery of permanent mass unemployment...there are still 1.5 million unemployed. A little under 2.5 million are on an incapacity benefit. The proportion of births outside marriage has risen still further from 40 percent in 2001 to 47 percent in 2011. This compares to only 6 percent back in 1961. There are 3.2 million children being raised by sole parents...truancy from school remains high....illiteracy is widespread. It is true that crime appears to be falling which is welcome...there are some reasons for hope but for the time being the welfare state we're in remains pretty grim."